LOVE! I could live with these pieces, but unfortunately the colors would totally not work in my house (: There must be a way to squeeze that bench or weathered chair in somewhere! LOVE! the union jack is so stylish, no? Wow! Bold and dramatic! Love the colors. Thanks so much for stopping by. Love these, how fun! However, prob wouldn't mesh well with the shabby beachy look I'm trying to go for in my place. Also, thanks for your sweet comment yesterday, they keep me blogging! I have seen the ottoman in person and love it. It doesn't work in my home, but I think it's a fabulous piece. Crumpets and tea in your new kitchen sounds lovely! I think rock 'n roll when I see these. All a little over the top for me but that last chair is worth making a few changes in my color scheme to somehow include it! Love those, I SO could live with them! I do love it! They are showing the Jack on several upholstered pieces in the entrance to the D and D-so chic! i've always loved that bottom chair. Yeah, I'm kind of digging the ottoman. i could live with all of them, gorgeous things! The Love seat is adorable!! Erica you can Anglophile me all you want. Never get enough. I'll take tea with a spot of lemon pretty please! Oh I really love that ottoman! 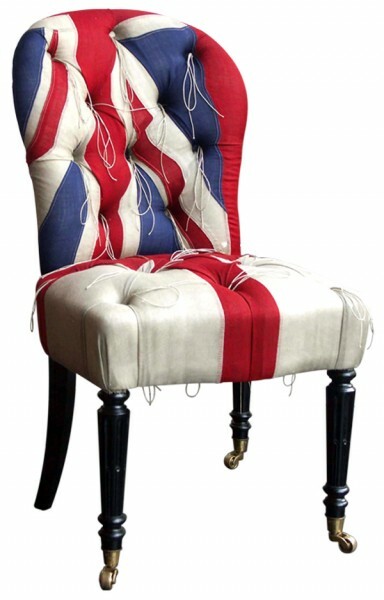 I would love to have a union jack in my home. Thank you so much for the sweet comment! I will be following as well! Somehow this flag really lends itself to great designs. Love your choices! oooh! I do love the union jack as well!!! Thank you so much for your kind words and visit to my blog! and you are right! the flags would have been perfect for your little boy's party!! Great finds! I almost ordered my Mini Cooper with the Union Jack on the roof but settled for a black roof instead - but I do have a little replica one on my shelf with the Union Jack! Even if not my style I love Union Jack fabrics! it's so perfect! Thanks a lot for visiting me! I hope you'll be back! Love, love, love these! That ottoman is perfection, I'll take it!!! That CHAIR is just tooooo cool! I love a good union jack. Have you seen this chest?